Today was the first rehearsal for the World Premiere of "Sometimes A Great Notion" adapted & directed by Aaron Posner at Portland Center Stage. It was a truly inspiring first read through. This script came to us a couple of years ago and I first encountered it at our first workshop reading. 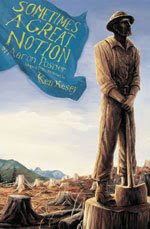 I immediately fell in love with Kesey's characters and felt a sense of new found pride for Oregon. This is a great work of fiction and Posner has perfectly captured Kesey's world in this adaptation. I am pleased to have been a part of this process and am so glad that the work will have its premiere at our theater in its home state. This script reminded me today why I love love LOVE theater and I highly recommend coming to see the show. It opens April 4th on the Main Stage. Click Here to find out more.